Maira Verónica Figueroa Marroquín (in the cover picture) is 34 years old and lives in El Salvador, central America, with her family. She spent the last fifteen years of her life in a maximum security women’s prison. This woman’s story fits perfectly in the dramatic sociopolitical environment that is typical of the society of El Salvador. In fact, according to the last report by Amnesty International, this is one of the most dangerous countries on the planet for women. Moreover, it has one of the highest rates of murder, even if the real fact has considerably lowered during the last two years. And, as I said, the field of women’s rights is probably the one that gets mostly slaughtered by state’s politics. The law about termination of pregnancy is the main example (and dramatic): abortion is always illegal. Women must get to the end of their pregnancies even if they’ve been raped, or if their health is in danger. Adhering strictly to the criminal code of El Salvador, the penalty for women who get abortions can be up to eight years of incarceration, but, in almost every case, judges consider abortion as an actual murder, that has to be punished with penalties from thirty up to fifty years. The story of Mrs Marroquín get inside this dynamic from a secondary door, in an even more absurd way. In 2003 she was condemned to thirty years of incarceration because of a miscarriage, probably caused by the efforts she made (and withstood) every day, working as the governess of a big household. Once she arrived at the hospital, the bleeding that started at work didn’t let the fetus breathe, and the doctors had to declare the death. The day after the woman was immediately charged with murder, and thus arrested. And, almost without the chance to defend herself – because since the beginning of the trial the public defender wasn’t given to her – condemned. 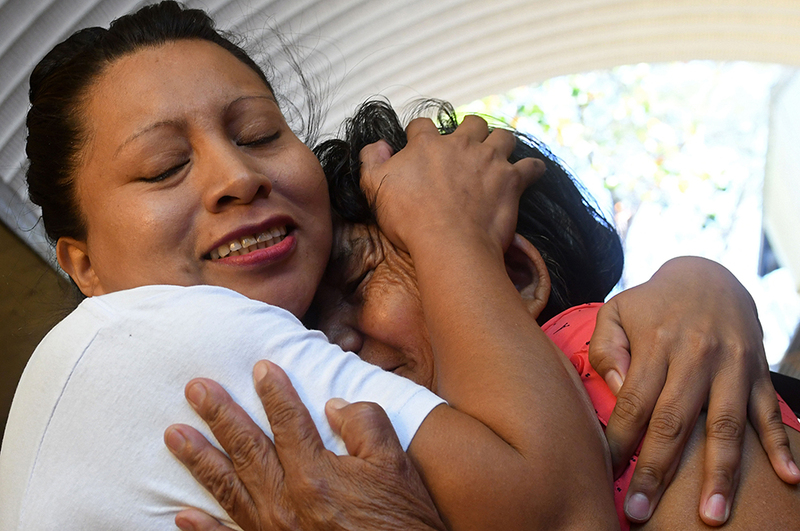 Nevertheless, thanks to a big movement among the main international associations for women’s rights, the penalty has been switched and Maira Verónica managed to come out of prison, being reunited with her family. Her first words has been: «I’m very happy to be able to see my daughter again. I hope that the others will be offered the same opportunity as me». Obviously she’s referring to all the other women that are staying in prisons all around the country for matters concerning abortion – 26 are those who got condemned because of a miscarriage. Among these women, one of the most famous stories, that also appeared on every single main newspaper in the world, is the one of Teodora del Carmen Vásquez (in the photo above). Her story is very similar to Maira Verónica’s one. In 2007, while she was 9 months pregnant and working as an employee in a school, she called the hospital in despair because she had a severe haemorrhage. But she didn’t receive any answer, and the fetus died soon after. So Vásquez got condemned in 2008 to the same penalty as Maira Verónica Figueroa Marroquín, and she was forced to abandon the other child who was just four years old. When she’ll get freedom, he will be fourteen. Sadly, stories like these are daily bread in El Salvador. Even more since 1998, year in which, due to impositions by the Catholic Church – that is an ever-present and ruling institution in central America – the government forbid, in every form, the termination of pregnancy, being it intended or not. According to data by Agrupación Ciudadana de la Despenalización del Aborto (the association in El Salvador that deals with supporting the victims of laws about abortion), during the decade after the approvation of the law (in 1998 as I said) there have been about 129 trials for women, and 49 of them where condemned for homicide. Furthermore, data from the Ministry of Health point out the fact that deaths due to dangerous pregnancies that haven’t been stopped are around a hundred, mostly between 2011 and 2015. On the other hand, data about illegal abortions get up to 20.000; the cases of pregnant minors, between 10 and 14 years old, that are often victims of abuse, to whom is always forbidden to undergo an abortion, are around 1445. March, ended up with a great accomplishment for the far-right party. So, change seems to be far, even if, on 8th March of this year, hundreds of women marched in the main streets of the capital, San Salvador, asking for the abolishment of the law that forbids abortion, showing their untamed strength and courage that, unfortunately, don’t seem to be enough.